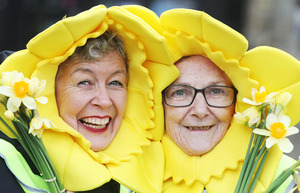 Volunteers, from left: Nuala Gillick with Margaret Beere from Dublin selling daffodil to raise funds for the Irish Cancer Society’s free, nationwide care services for those with, and affected by, cancer in Ireland. Daffs In Your Area The Flower Children Happy Daffodil Day Is That A Narcissus? 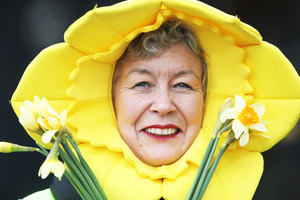 Posted in Misc and tagged Daffodil Day at 12:08 pm on March 22, 2019 by Bodger. Jesus I thought it was Theresa May at first. But fair dues. In fairness. A big thanks to the ICS for not only providing zero help or support but the condescending attitude they showed my family member when she contacted them when terminally ill. You really went the extra mile when it came to talking down to a dying person. Well done all. I wouldn’t give them a penny. According to the accounts half of your 1 euro goes straight to fat cat CEOs, admin staff and the rest goes to advertising companies to stick up patronizing billboards and media campaign telling people what you already know about how to prevent one type of cancer (ie :don’t smoke) , t-shirts. merchandise and stupid daffodil costumes (to be added to landfill or the ocean garbage patch later) like the ones the two auldwans in the photos at wearing. A fraction gets thrown to cancer research and that’s so small it probably just pays for some researchers to fly first class, ostensibly to attend a conference, but really its just to schmooze over cocktails and engage in extramarital shenanigans in a fancy hotel in a nice city. They arrange unpaid volunteers to maybe, just maybe give people a lift to hospitals and stuff like that. Wow! thanks ICS! 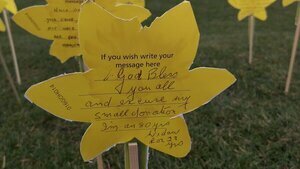 Daffodil day does nothing but raise awareness of the Irish Cancer Society in and of itself. They dare not tackle the meat industry, booze or the link between sugar and cancer. And you can guess why. The volunteers mean well I’m sure, but this is Ireland, charities are run by unscrupulous snakes as has been proven time and time again. read the PDF spending report if you don’t believe me. Christ! the gory images on the cigarette packets did more to prevent cancer in the last year that the ICS. The more you give them, the more they will pay themselves. The money you give this year will be used to print out more t-shirts next year, the perfectly wearable ones the chuggers out there today are using will be in the bin in a few months, because certain people need to get paid. Absolutely 100% spot on there Pat. Makes me utterly sick to see all the good intentions of the likes of the people above being taken advantage of by cynical scumbags. It’s just a circle jerk of the usual suspects really. I was tempted to saw something to a volunteer at lunch about an hour ago but decided against it as my ire is not towards those good people. The only reason I looked this spending report up is because my mother died of cancer and had a ICS donation bucket next to her corpse at the funeral home and we got a thank you letter form the ICS for the donation of 1500 ish a few weeks later. I don’t think she actually sought the ICS services when she was sick because she already had a support system with family and health insurance. So she didn’t experience what your family member did. For all she knew the ICS was a benign organization and thought it would be a good thing. If I knew what I knew now I would have pocketed a load of that cash myself when no one was looking (except Jesus, ha!) and I would have slept like a baby. An eye opening thread. Thanks for sharing pat and Ian, and condolences to both of you. It’s kuhnt of an illness, and taking advantage of people who have it and their loved ones is such a scummy thing to do. well said Pat. 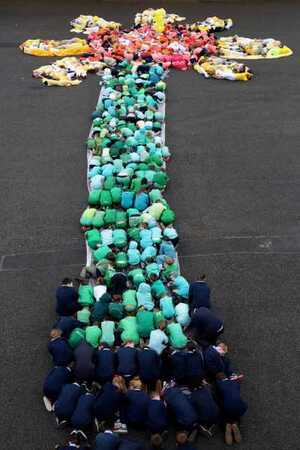 When my child was diagnosed with cancer we received €1000 from Irish Cancer Society. And that was the last we heard of them. Do not give your money to Irish Cancer Society. There are great cancer charities out there, find them. Ask where and what your money will do, what support it provides. Give your money to Aoibheanns Pink Tie or Purple House or Blood Bikes. These people offer real support, genuine practical support. A thousand euro wouldn’t cover our parking fees in Crumlin. What the bloody hell are the Irish Cancer Society doing that they can’t even successfully lobby for that. Yeah I had cancer and rang them asking about diet and exercise. They did fupp all for me. Weren’t even nice on the phone. Don’t give your money to them. OK, fair point. Been informed. It’s just a circle jerk of the usual suspects really. I was tempted to say something to a volunteer at lunch about an hour ago but decided against it as my ire is not towards those good people. 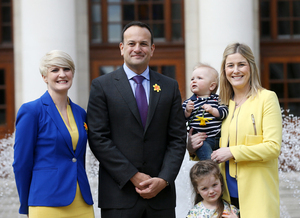 As a sufferer of chronic cancer for the past 2 years I have not given ICS a single cent on Daffodil Day for the reasons that Pat gave and because I don’t agree with the huge salary that Averil Power gets. €40k–€50k is more than enough of a salary not €120k. And she was taking almost a hundred from the Asthma Society before that, what kind of vulture is this woman.